Grim Mars is a new black death metal band from Sudbury, Ontario of Canada. The band was founded in 2007 by Greg Mars (also in Wolven Ancestry) under the name Grim. In 2011 his band-mate Vesper joined him and together they formed Grim Mars, a band with a totally different lyrical concept. On December 21st, 2012 the band released its debut full-length album “Defiled Earthen Architectures” via the Canadian label Archaic North Entertainment and this remains their only work up to date. “Defiled Earthen Architectures” includes 10 tracks with a total duration over 57 minutes. They play black death metal, with melodic and orchestral touches, as well as a few avantgarde elements. Guitars and bass are more dominant in their sound, together with Greg’s black metal screaming vocals. Their synths have mostly an accompanying role, but sometimes they become more active, giving a symphonic color in their music. There are also two wonderful instrumental tracks, “Cydonia Labyrinthus” with a clear ambient aesthetic and “…And the Sun was No More“, whose beautiful acoustic instruments add something dreamy in their atmosphere; I’d like to see the band experiment more with this acoustic style. 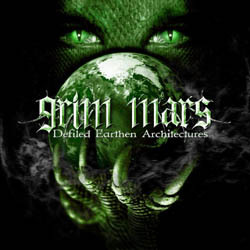 Grim Mars have a powerful solid sound and their songs often become quite technical, but their production still needs improvement in order to capture the full extent of their music. The rhythm of their songs moves between mid and fast tempo and their compositions have a fragile balance between brutality and melody, with none of them reigning over the other. Their lyrics are in English dealing with extraterrestrial theories, ancient history and secret societies, but unluckily they are not in the CD booklet. Summing up, I find “Defiled Earthen Architectures” a very decent debut effort and I hope to see how this band will evolve in the future. There are many good ideas and potentials in Grim Mars, but there is something missing to take their music to the next level. Hope their next work does it, after all it’s only their first album. Fans of black death metal better keep an eye on them. “Defiled Earthen Architectures” is released by Archaic North Entertainment in a standard jewel-case CD-r edition with 2-page booklet. Cover artwork is by Georgi at Moonring Design and album layout by Mark Howitt. You can visit the band’s official pages below and listen to the whole album in their Bandcamp page.